Barthelona and Yesterday’s Songs are our runners on our home track at Flemington today. Barthelona (pictured) won his last start at Flemington and he runs in race four, the Country Achiever Quinton Scott Handicap over 1400m with Lachlan King to ride again. The four-year-old has pleased Mike Moroney leading up to the race. 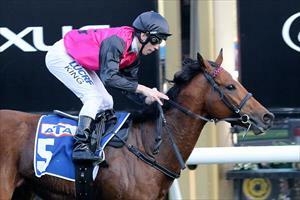 “He has had a good fortnight since his excellent win and we can't fault him,” Moroney said. “He looks bright, has been eating well and his work has been very good. “He runs in the same rating race he won last start, the only difference is that he goes up in weight. Yesterday's Songs runs in the last race of the day, the Grampians Region Handicap over 1100m with James Winks to ride. It will be the fifth run this preparation for the seven-year-old. “We’ve kept him very fresh only doing quiet pace work with him since his last run which he seems to be enjoying,” Moroney said. “He is a very happy horse at the moment, is eating well and is very bright. “He was not beaten that far last start over a shorter trip and I’m confident he will run a much improved race over the 1100m and James Winks has had success on him.